Carmakers offer more features only in the top-end variants of their cars. But here’s a thought. Can you buy a low-end variant of a car and retro-fit some of the gadgets in it to make it equivalent or better than the variants above it? Yes, you can. But not safety features. Sadly, many carmakers offer safety features only in the top-end variants of their cars, especially among hatchbacks and entry-level sedans. Among hatchbacks, only Honda offers ABS and airbags in all their variants, while in mid-size sedans, the Ford Fiesta, Honda City, Nissan Sunny and Renault Scala offer ABS and airbags in all variants. 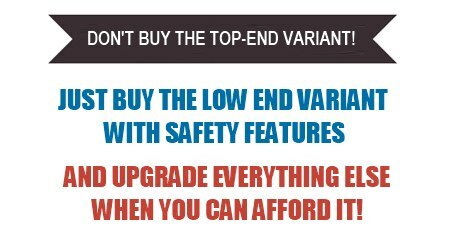 So if you want safety features, you either have to buy the top-end variants or pick from this limited set of cars. For instance, if you buy a base Honda City for about Rs. 7.3 lakh ex-showroom, and spend another Rs. 1.5 lakh on it, you can make it better than its own top-end variant, and equivalent or better than some of its competitors. CarToq lists some of the cool accessories you can add to your car for a budget of Rs. 1.5 lakh to make it equal to or better than its own top-end variant or the competition. Remote central locking with immobilizer is one of the simplest and must have accessories these days. You can get simple two-remote systems for as little as Rs. 3,500, going up to Rs. 12,000 for those that also incorporate GPS tracking systems and remote locking-unlocking using your cellphone. Companies that supply such systems include Autocop, MicroVBB, Phoenix, Silicon, Nippon and others. Genuine leather upholstery would straightaway set you back by nearly Rs. 1 lakh. But faux-leather upholstery is available for about 1/5th the price and looks just as good. Although for hot climates, leather upholstery is not a good idea as it tends to get sticky when hot, it looks good on the car. A variety of color schemes to match your car or even customize it are available with prices start at about Rs. 15,000 going up to Rs. 1 lakh. A set of good alloys will set you back by about Rs. 15,000 for a small car and about Rs. 20,000 for a larger car. Alloys completely alter the look of the vehicle and straightaway make it look a lot classier. They also give you the added benefit of better handling because of their lightweight and longer durability with less likelihood of rim bending. Parking sensors are a boon to have in city conditions, especially if you have a sedan or an SUV with restricted visibility. They come in various types. Some are just audio warnings with a standard beep to guide you, while others have verbal distance callouts and others come with a distance indicator display screen along with beeps. These can be fitted aftermarket without voiding a vehicles warranty, as many units come with snap-fit connectors that directly plug into the reverse-lamp wiring of your car. If you car already has DVD display screen in it, you can directly plug in a reverse camera and use that as a display. Else you will have to buy a parking camera system that comes with a camera and a display. (Some even come with sensors, camera and display as a set). The display can be fitted on the dashboard or you can get a rear-view mirror with a display screen built in. Bluetooth hands-free devices are a necessity these days. One should never operate a mobile phone while driving and hence a completely hands-free system is useful. One can get simple Bluetooth hands-free devices from Jabra, Plantronics, Motorola, Nokia and others that clip on to the sun-visor in your car and pair with your mobile phones. You also get Bluetooth rear-view mirrors that display the caller number in your mirror and also sync with your car audio system through FM or a cable. Many music systems come integrated with Bluetooth facilities, starting from about Rs. 9,000 onward – they can make and receive calls, as well as stream music from your cellphone. If you’ve bought a low-end car that does not have power windows, you can even get these fitted after market. You get complete power-window kits for all cars from basic 2-window models to all-four windows and even remote opening-closing facility that integrates with the car’s central locking system. If you car does not come with fog lamps, there are plenty of choices in the aftermarket that will be able to fit your car. Models range from the standard 55watt halogen fog lamps to HID units. One can even choose to add auxillary lights from Hella or Lightforce, if lights are something you fancy. Some brands of music systems offer optional steering-mounted audio remotes for their systems. Almost all high-end aftermarket systems come with a regular infra-red remote that one can operate from anywhere in the car. But a steering-audio remote as offered by Pioneer and Kenwood clips on to the inside of the steering wheel and can be easily accessed by the driver without taking his hands off the wheel. Especially useful in cars which don’t offer steering-mounted audio controls. There is no limit to the amount you can spend on a car audio system. One can get basic audio systems for as little as Rs. 3,500 including two speakers, going up to a few lakh rupees for high-end multimedia systems that can put some recording studios to shame. Component speakers, amplifiers, sound damping, cabling can all add to the costs and depending on your budget, there are innumerable choices. Some high-end audio-visual systems include DVD playback capability, Bluetooth, GPS navigation and reverse camera integration. Depending on the car model you have bought and whether power-adjustable mirrors exist in the top-end variant of the same car, you can retro-fit power mirrors on to your model of car. For instance, power mirrors from the Mahindra Scorpio VLX can be retrofitted on to the Mahindra Scorpio LX, although this is not a straight aftermarket fitment. Not all cars can be retrofitted with sun-roofs as the fitting of sun-roofs involves cutting of sheet metal of the car and could hamper its structural integrity. However, if there’s a variant in the model lineup of car that you have picked that has a sun-roof, you can safely get one fitted in your car too. Companies such as Webasto offer sunroofs for just about every Indian car and take about 48 hours for fitment. However, this is not really a recommended accessory. Depending on the budget you have, you can easily upgrade your car from a lower grade variant to a higher one. Safety features can’t be retrofitted. And then there are some complex fitments such as a rear wiper-washer that would involve plenty of mechanical work and are not available aftermarket. The same goes for defoggers for the rear glass – it’s simpler to just replace the rear windscreen with a unit that has the defogger already glued to it. Share your thoughts on any other accessories that can go into upgrading your car from a lower variant to a segment beater! « Seven timeless cars we want back on the road!